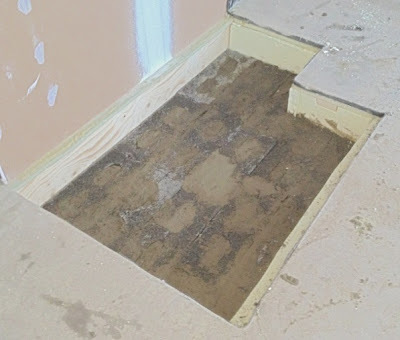 The first task was to cut the floor open, in order to reveal the special foundation of the fireplace, which was put in place with the rest of the foundations, and consist of a huge reinforced concrete block. As seen on the photo, some insulation is missing, and thus the structure of the house floor is revealed. 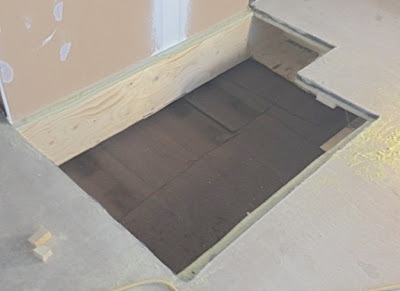 It is interesting to see that the concrete layer on the floor is really only just thick enough to cover the hoses for the floor heating, a couple of centimetre. First, polyurethane foam was used to seal the house against the concrete foundation, then the empty spaces were stuffed with FinnFoam (yep, that one again), and then a first layer of large, light-weight bricks was put down. Another layer will follow later in order to bring the foundation up to the level of the floor in the house. This will be done later, in order to allow the first layer to dry out properly. In the meantime, there are a lot more bricks to be brought into Our House to warm up and dry out.